Meeko's Shack is a run-down shack owned by the canine follower Meeko, who has inherited the home from his unfortunate owner. 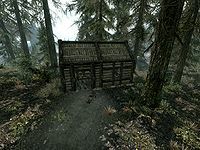 It is located on the edge of the Hjaalmarch marshland between Solitude and Morthal, a short distance from the road leading from Morthal and Dragon Bridge. Around the shack are several plants and flowers including three nightshade plants, a thistle and three purple mountain flowers. The shack is still fairly structurally sound. Inside there is a small set of shelves to the left of the doorway with a leek, three red apples, two carrots and an iron dagger on top. Beside this, in the northern corner is a food barrel with a copy of the Speech skill book A Dance in Fire, v6 on top. Against the northeast wall is a set of shelves holding a gourd, a loaf of bread and a bowl containing three tomatoes. To the right of this is a rack hanging from the ceiling holding a garlic braid and a rabbit. 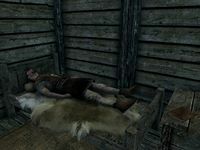 Against the southeast wall is an unowned single bed with the corpse of Meeko's former owner laying on top. It can still be used to rest. At the foot of the bed is an end table with a journal written by Meeko's former owner. It explains that he had succumbed to Rockjoint and that Meeko "was a loyal companion" and "would be able to take care of himself". Meeko runs back to the shack if you find him on the road. There is an iron ore vein to the northwest. A dragon mound can be found to the west of the shack. While technically owned by Meeko, none of the items inside the shack are owned and will not be marked as stolen should you take them. After you have discovered Meeko and his dead master, the body and bed will be disposed of automatically upon the next cell reset. This page was last modified on 22 February 2017, at 21:43.